Seawater desalination is increasing globally, and in light of this, it is necessary to look at the environmental and ecological impacts of desalination plants on the marine environment. Marine Impacts of Seawater Desalination: Science, Management, and Policy combines existing studies and new research into a unified work describing the interplay of seawater desalination and the marine environment. In particular, the book identifies knowledge gaps in the current data and recommends future research paths. The book also covers the established and emerging desalination processes and the policies and regulations applied to seawater desalination. 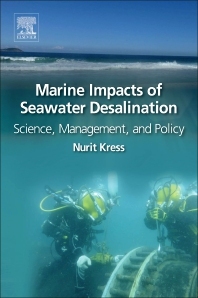 Marine Impacts of Seawater Desalination is an ideal reference for engineers and developers working on environmental-related issues of seawater desalination, scientists and researchers studying these issues, as well as regulators and decision makers who can use this book as a useful guide for planning and operating desalination plants. A multidisciplinary approach to understanding the environmental impact of seawater desalination on the marine environment. Real-world data demonstrating the environmental effects of seawater desalination. Impact of seawater quality and marine organisms on desalination operations. Discussion of foreseeable future effects and significant areas for further research on seawater desalination. Dr. Nurit Kress is a Senior Scientist at the Israel Oceanographic and Limnological Research, the National Institute of Oceanography, Israel. She holds a B.Sc. in Chemistry from Tel Aviv University, an M.A. in Chemistry from the University of Texas at Austin, and a D.Sc. in Chemistry from Technion, Israel Institute of Technology. Dr. Kress’ scientific research focuses on marine chemistry and oceanography, investigating both natural and anthropogenic processes using scientific tools common to both areas. The effects of seawater desalination on the marine environment has been her main research topic in the last 10 years.